A technology developed at the University of Chicago, and now being commercialized by a University startup, is addressing the intermittent nature of these renewable sources. It uses a selectively evolved, unicellular microorganism that helps convert electricity into methane gas. That gas can be stored, transported and used wherever natural gas is used, including for the generation of power on demand. Laurens Mets, associate professor of molecular genetics and cell biology, began developing the technology in the late 1990s. From it, the startup Electrochaea was born with support from the University’s technology transfer office, which is now part of the Polsky Center for Entrepreneurship and Innovation. Electrochaea was selected for the 2014 Global Cleantech 100—a list of 100 private companies with the greatest potential to solve the clean energy crisis according to the market intelligence firm Cleantech Group. It has experienced a string of successes, including a large-scale demonstration facility that delivers methane to Denmark’s pipeline grid and a commercial-scale plant announced in October to be built in Hungary. “The disruptive energy storage technology developed by Dr. Mets in his lab has been validated by Electrochaea and is now being shown to scale in a commercially meaningful way,” said Cristianne Frazier, senior project manager of technology commercialization and licensing at the Polsky Center. At the center of the power-to-gas technology is a strain of methanogenic Archaea—a microorganism that Mets adapted for industrial use. The process starts with surplus electricity that is coming from a wind farm or solar array, but isn’t needed immediately. That power is used to convert water into hydrogen and oxygen. The hydrogen is combined with waste carbon dioxide from any of a variety of sources, such as a biogas or an industrial process, in a proprietary bioreactor in which the microorganisms efficiently catalyze conversion of the mixture into methane and water. The resulting methane can be transported in existing pipelines or converted into compressed natural gas or liquid natural gas, making it available to generate electricity. The technology offers a large carrying capacity—more than competing bulk-energy storage systems, such as batteries, pumped hydroelectric and compressed air, according to Mets. The technology enables increased use of variable electricity sources such as wind and solar by storing excess power, thus smoothing out the variability and making renewables more feasible and economically viable. The carbon dioxide produced by burning the methane product of the process was waste from its original source and would have been released into the atmosphere in any case. The power-to-gas technology is thus carbon-neutral in its primary impact on the environment. It has the additional important impact of displacing net carbon emissions from burning of fossil fuels for energy generation with energy derived from renewable wind and solar sources. Mets continues his research at the University and aims to refine the novel technology. He hopes to adapt it to produce gasoline and jet fuel. The links between the company and the University are numerous. The University recognized the importance of Met’s discoveries early on and filed several families of patent applications that would be licensed to Electrochaea and become central to the startup’s intellectual property portfolio. “The technology commercialization and licensing team at the Polsky Center, Electrochaea and Dr. Mets have worked collaboratively on everything from company formation and technology development to Series A financing and patent prosecution, and I believe those relationships have helped foster a successful company,” Frazier said. Created in 2006, Electrochaea first validated the process in its laboratory in St. Louis. 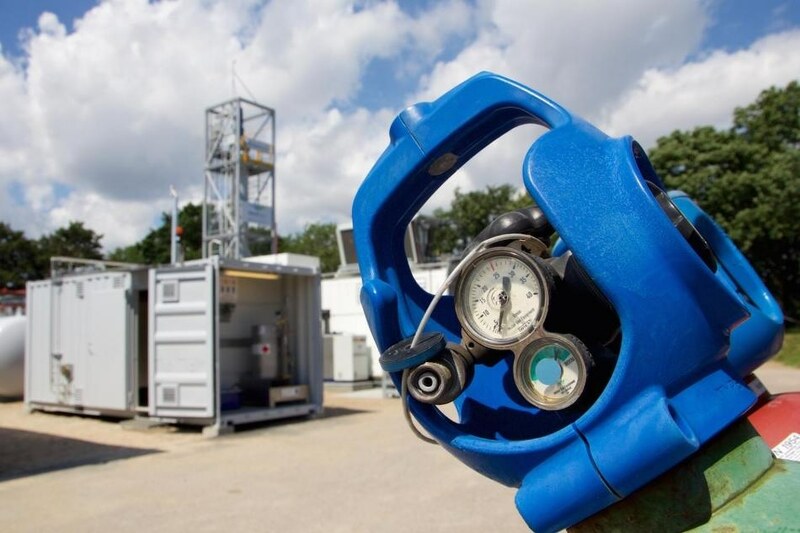 It began field testing Mets’ power-to-gas technology in 2011. Three years later, Electrochaea started constructing a large-scale demonstration facility at a wastewater treatment plant outside Copenhagen, with the treatment plant providing the waste carbon dioxide used in the conversion process. Based on the success of that project, which is called BioCat and went live in June, Electrochaea is building a 10-megawatt plant in Hungary that will be the world’s first commercial-scale power-to-gas plant. “Electrochaea ramped up very quickly, with several steps, from the one-liter reactor in my lab at the University, through the one-megawatt BioCat project and now the 10-megawatt commercial plant in Hungary. The microbes have proven to be very robust,” Mets said. The Hungarian plant will be built by Electrochaea and Magyar Villamos Muvek, that country’s largest energy provider. As with BioCat, the new plant will provide methane directly to the existing system of natural gas pipelines. Electrochaea plans to build an additional plant in Switzerland and envisions plants with up to 1,000 megawatts of capacity. Meanwhile, Pacific Gas and Electric Company is building a small demonstration plant at the National Renewable Energy Lab in Colorado.